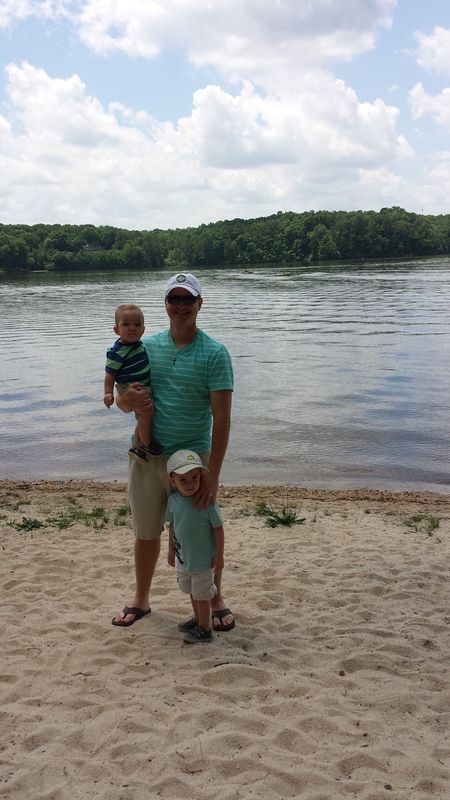 The Smith Family has been in North Carolina for a little over a month now. It’s been a fast month, yet we’ve done a lot of exploring! When moving to a new area of the country, you don’t always know what you’re getting yourself into or how you’ll like the spot you’ve chosen to live. We got so lucky when we moved to Pennsylvania when we happened to find the small town of Lititz. It had charm out the wazoo and was so safe and friendly. 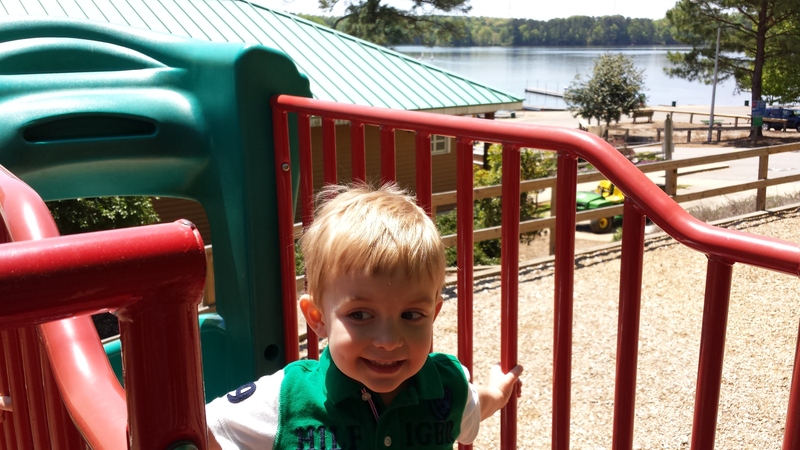 We always said we hit the jackpot finding that little city, and so far the feeling is mutual with Garner, NC. Chris had no idea how close we would be to Downtown Raleigh when he found our rental house in Garner. One day we were driving around looking for restaurants or Target or something of the like, and we suddenly saw all the big downtown buildings in front of us (less than 15 minutes from our house.) Raleigh is a very inconspicuous city. It’s surrounded by suburbs and nestled in between huge oak trees. 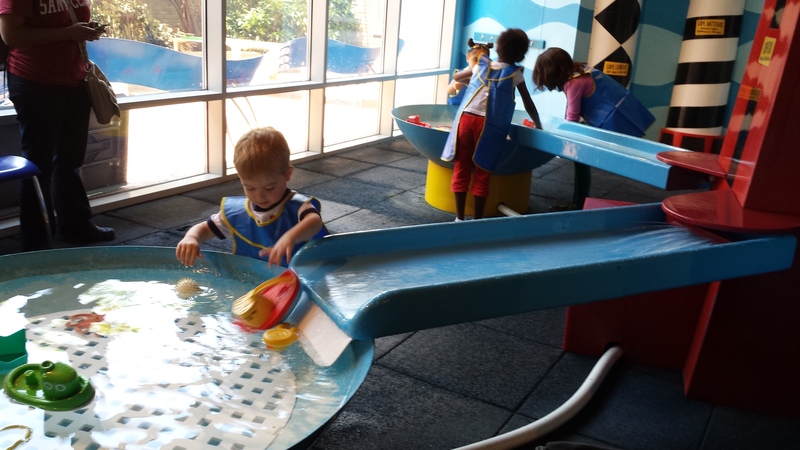 We’re loving taking advantage of all it has to offer; food truck rally’s, fun restaurants, beautiful parks, a weekly Farmer’s Market, and an AMAZING kids museum. It also helps that we moved here during the most perfect time of year so we are able to get out and about and enjoy all that the area has to offer. 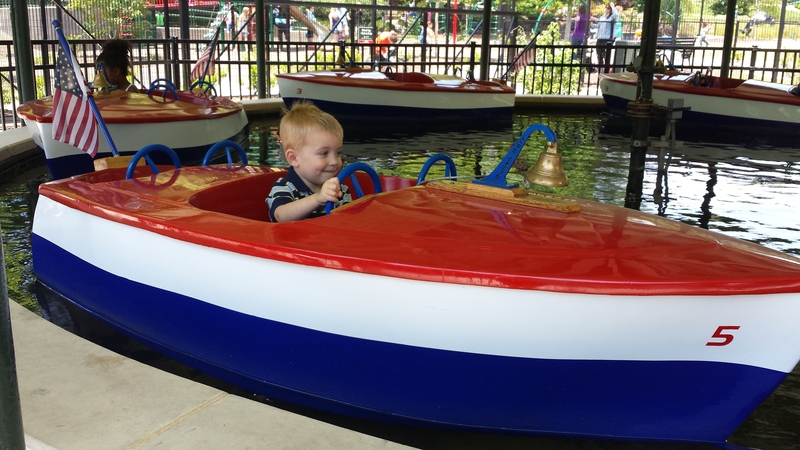 Riding the Kiddie Boats at Pullen Park in Raleigh. Our little town of Garner seems to be going through a growth spurt. There are several new shopping plazas-two Targets within 10 minutes of the house (moms you get how important this is!) We also have two lakes within 10 minutes of the house. 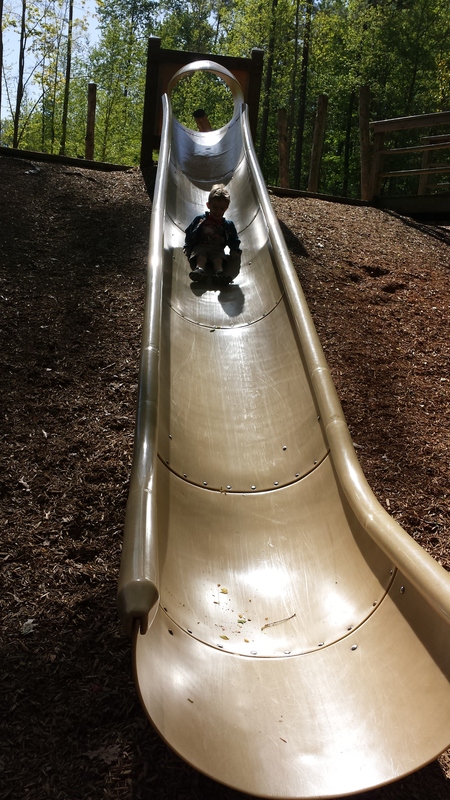 The kids are loving going to the parks, story time at the library, and playing in our new backyard. 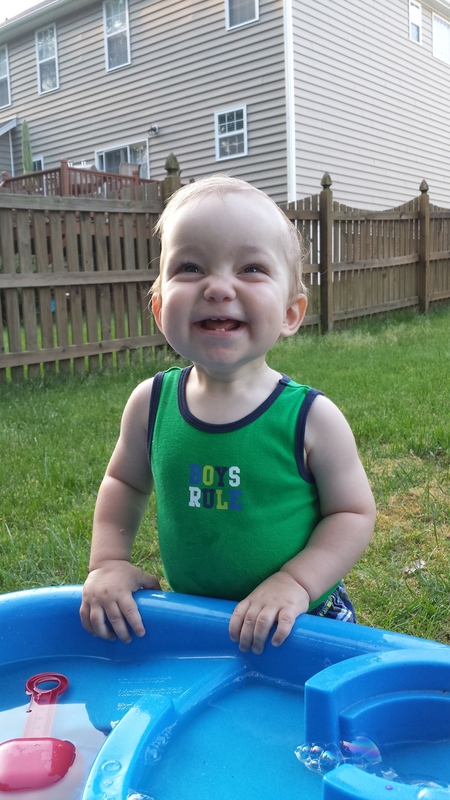 Bubba playing in our backyard- lovin’ tank top weather! 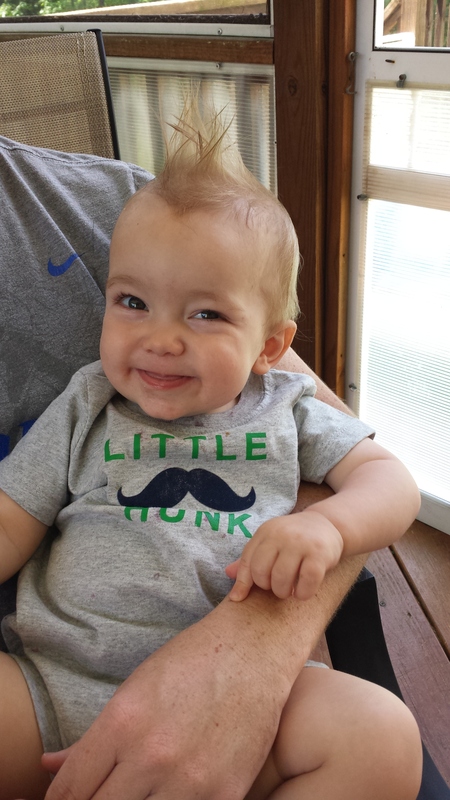 Brady is enrolled in pre-school for the Fall and he can’t wait to make some little friends. 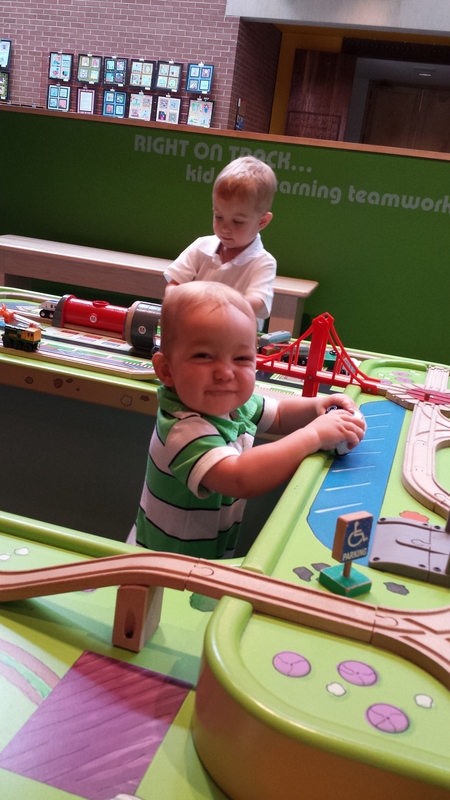 He truly misses our playgroup in Pennsylvania (as do I!) but is loving all the kids in our new neighborhood. Everyone has been super welcoming which has made the transition “back down south” that much sweeter. Our house is almost completely unpacked, but to be honest, we have put some housework on hold recently because we are just having too much fun on the weekends getting to know our new city- hanging pictures can wait, right?! 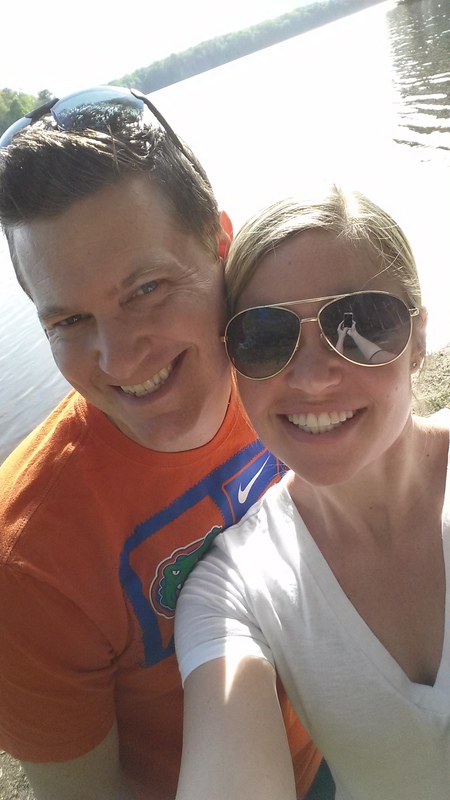 Chris is loving getting to know all the golf courses in the area and trying out the local breweries. He’s looking forward to getting his motorcycle out and also doing some fishing since the weather is so nice right now. I’m loving that we are less than 2 hours to the beach and 2 hours from mountains. I can’t wait until we get some family and friends up here to visit and can help us do some more exploring! Recently, I bought a whole bunch of beets for a recipe that Brady and I made for Food Revolution Day. 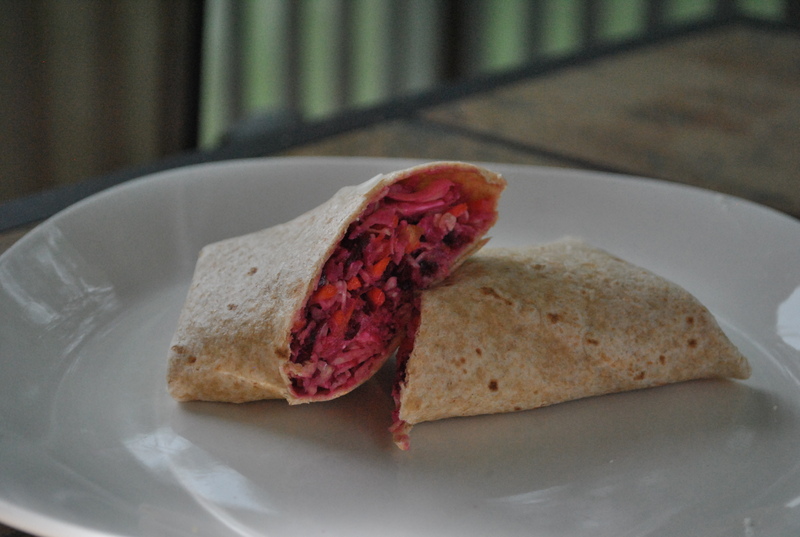 I’ve never been a beet girl, per se, but they were pretty tasty in the Rainbow Salad Wrap we made. Nonetheless, we had a whole lot of leftover beets. I wasn’t sure what to do with them, but after seeing how amazingly vibrant and purplely-red the juice was, I thought, this would make a fabulous paint color! I sliced the beets in different directions so they would all have a different shape. 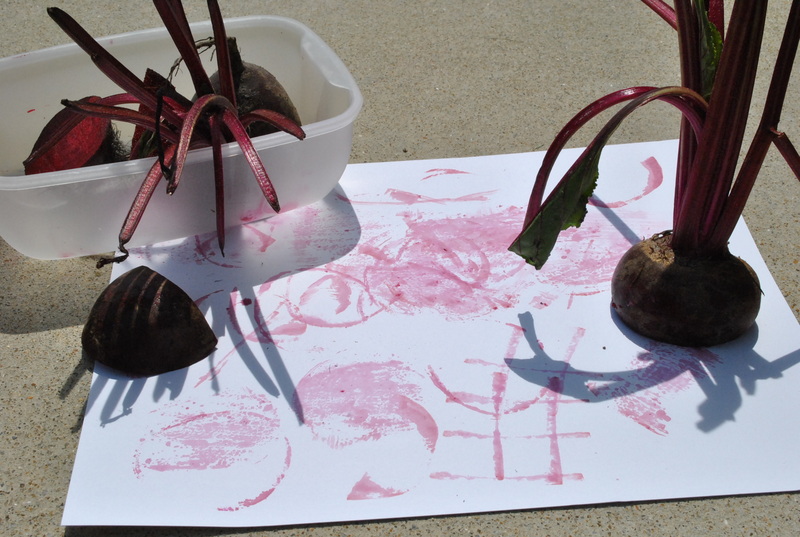 Then, we went outside and used the beet chunks like big stamps. This was easy, and not nearly as messy as I would have anticipated. 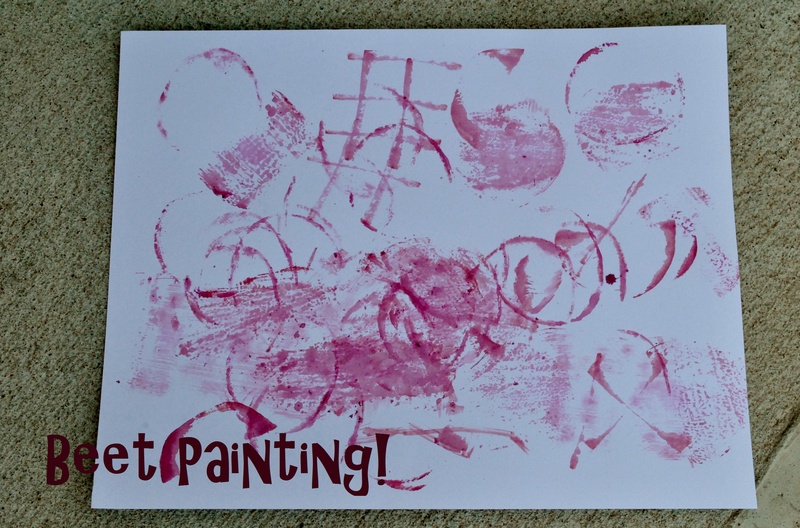 If you ever have a leftover beet or happen to find them at a farmer’s market for a really cheap price, give this activity a try with your little one! Happy Food Revolution Day! Jamie Oliver’s goal is to get as many kids and families from across the globe, in the kitchen together today. I’m taking part in this day because I love Jamie Oliver’s philosophy on the importance of getting kids involved in the food they eat. To participate in this day, our family made Jamie’s “Rainbow Salad Wrap” recipe. I have to confess, when I first saw the ingredients (raw beets, pears, green cabbage…) I was a little concerned. 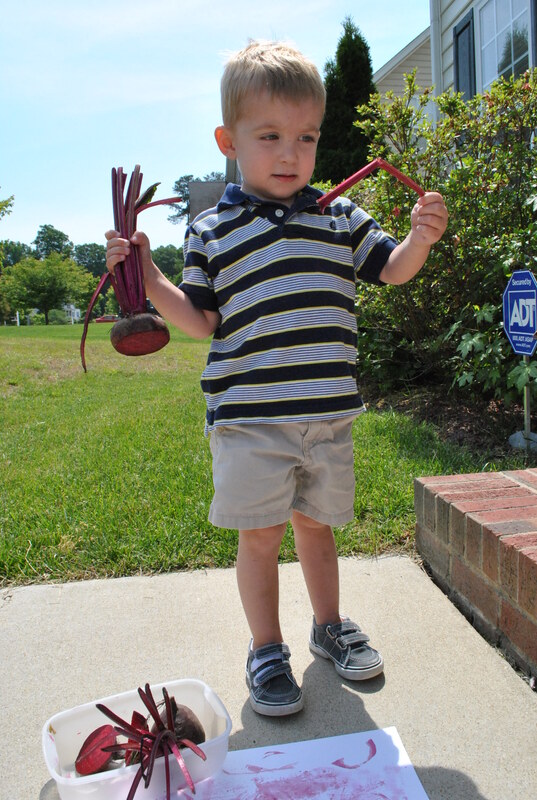 I’ve never eaten raw beets, let alone tried to feed them to a two year old! I was up for the challenge because, if I’m not willing to be adventurous when it comes to eating new foods, how can I expect my kids to be willing to try new things?! I also have to admit that I took some short-cuts with this recipe. It calls for you to shred all of your own veggies, but when I saw pre-shredded cabbage and carrots in the store I thought, umm, yea, let’s do that instead! I did however shred my own pear (with Brady’s supervision!) and beets. Here’s my PSA for beets- they’re M.E.S.S.Y. 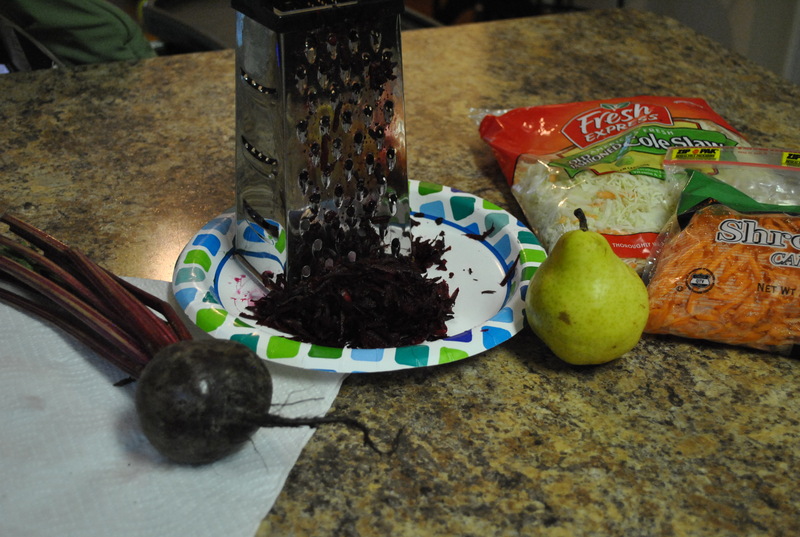 If your child is old enough to use a box grater and shred the beets themself, please use gloves and an apron, or be prepared to have stained hands, countertops, clothes, etc. I took on that task myself, and it was still messy. 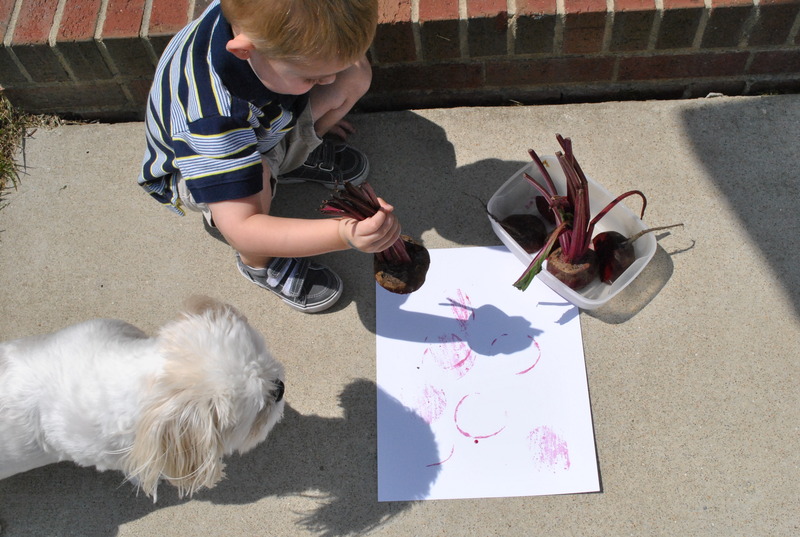 I kept thinking, we should totally use beets to paint with- outside. 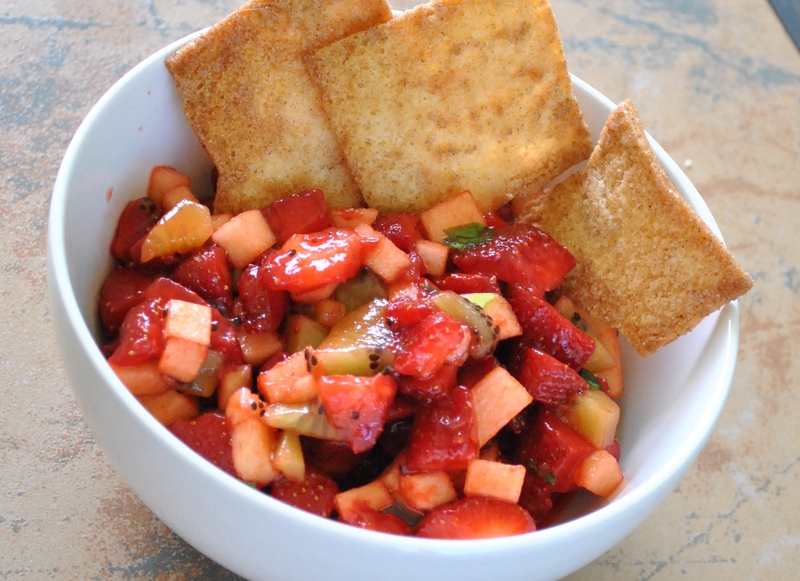 Other than the beet mess, this recipe is super easy to put together! Shred the veggies and mix together. Whisk up some cider vinegar, EVOO, mustard, and yogurt for the dressing. Once you mix the dressing and veggies together, top it with some feta cheese and roll it in a whole wheat wrap. 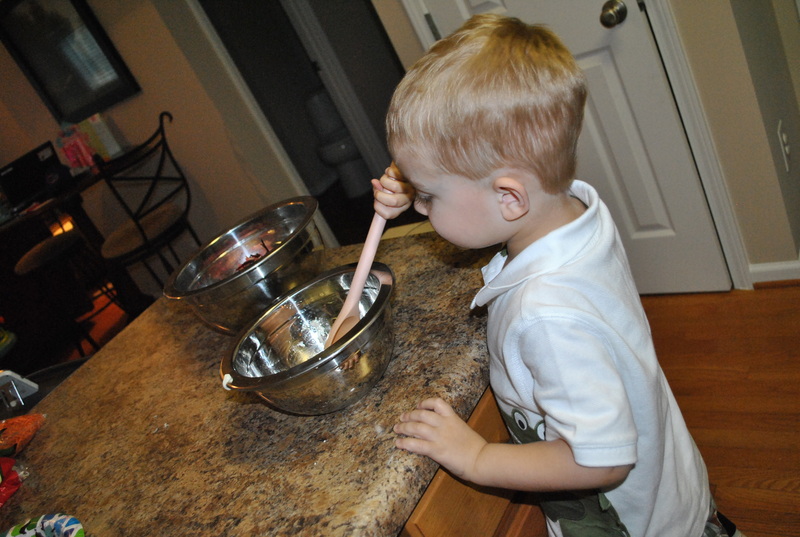 Brady enjoyed measuring, stirring, and as usual, tasting ingredients. (He loves shredded carrots!) But, there’s also something to be said about the amount of conversation that goes on while preparing a meal. From helping me pick out the ingredients at the grocery store, to picking herbs from our herb garden that he helped plant, to reading through the recipe together, there’s some really valuable dialogue that takes place. I wasn’t sure what Brady would think about this meal. But, no joke, the first words out of his mouth after he took a bite were, “Yum. That’s delicious.” Chris and I both said, “Really?! Yay!” It just goes to show, you should never underestimate what a kid will eat or enjoy. This food was new to him, but it was colorful and fun looking. 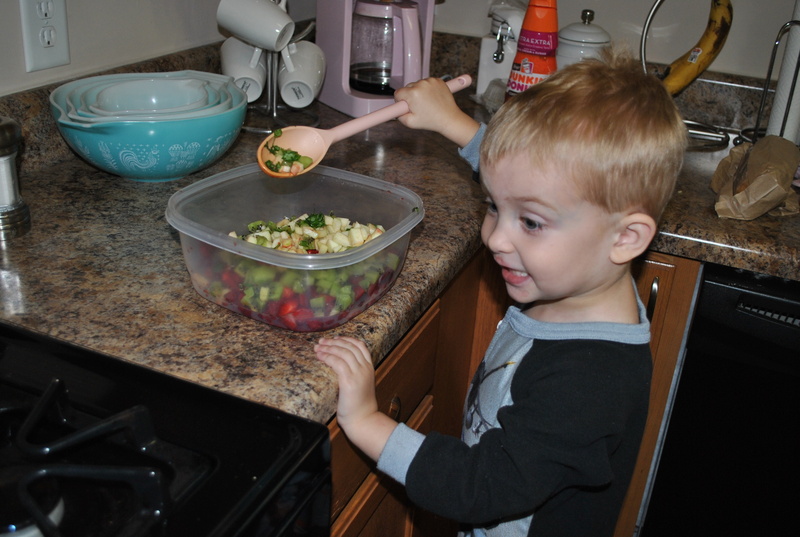 Plus, Brady was the one who helped mix the dressing and stir it all together and top it with cheese. To him, he cooked it, so it had to be awesome! This was a fun recipe to make and it just makes me so happy to think that kids around the globe were cooking and eating the same thing that my family was! For more info on Food Revolution Day, check out this site. 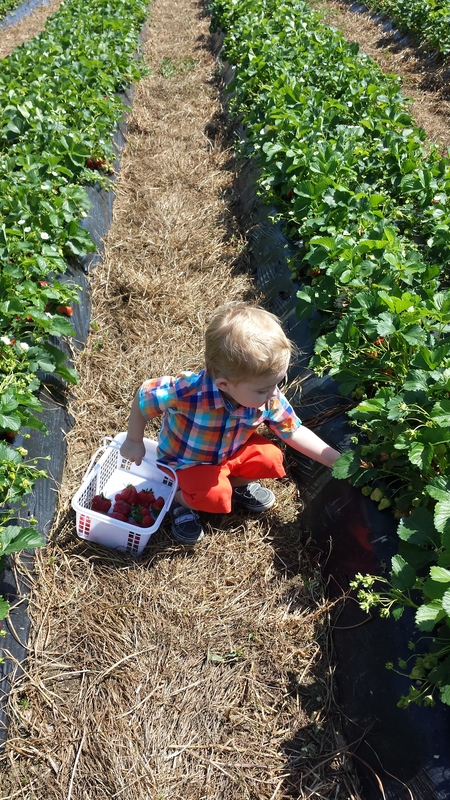 We recently discovered a small strawberry farm near our house that let’s you come pick your own strawberries. 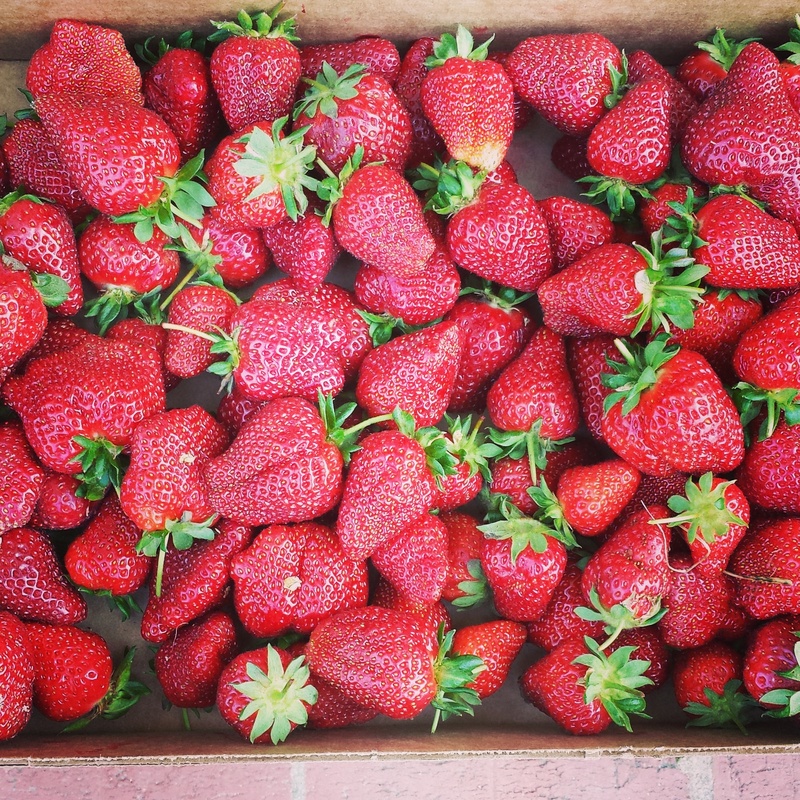 They are the most delicious strawberries I’ve ever had!!! So sweet and so juicy! 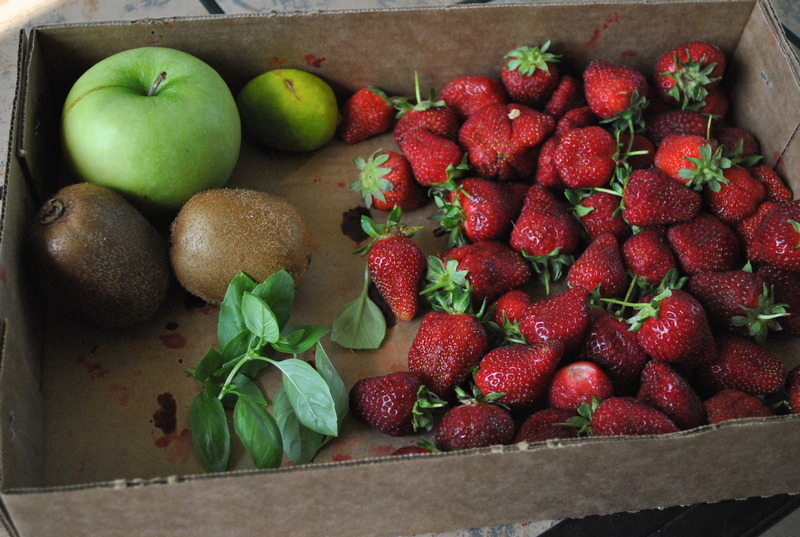 We’ve gone a couple of times recently because they are so ripe right now. This recipe comes together so easy. 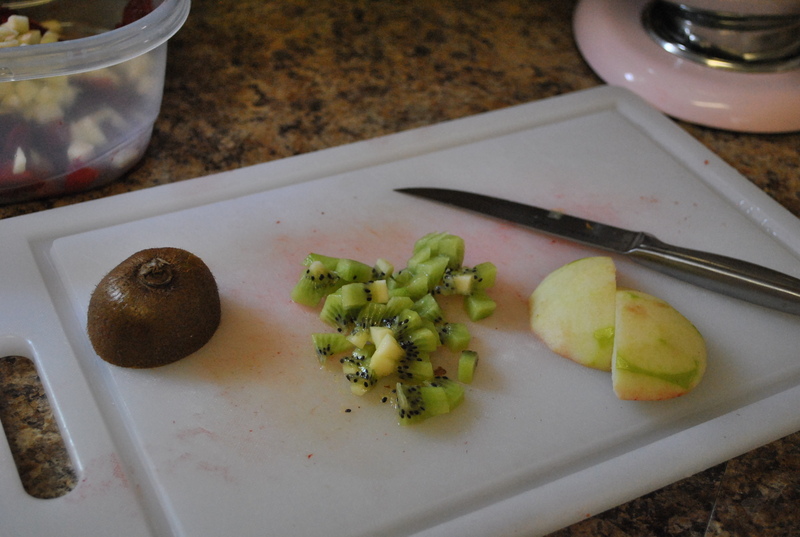 You chop, dump in a bowl, and mix. It gets tastier if it sits for an hour or so, but you can also eat it right away. We loved that it was such a refreshing, light dessert. The hubby liked the pop of basil and Brady could’ve just eaten it with a spoon. Mother’s Day is a perfect time to reflect on the hard work and love that goes into being a mom. I am lucky to not only have a selfless, strong, amazing mom, but also aunts,a grandma, and step-mom who have all been a blessing in my life. All of these women have had an impact on the kind of person I want to be and the way I want to raise my boys. With that being said, it’s important to note that being a mom is not always a fun, easy gig. It can be gut wrenching, stressful, and all– consuming. To know that every move you make impacts the life of someone else, is quite humbling. 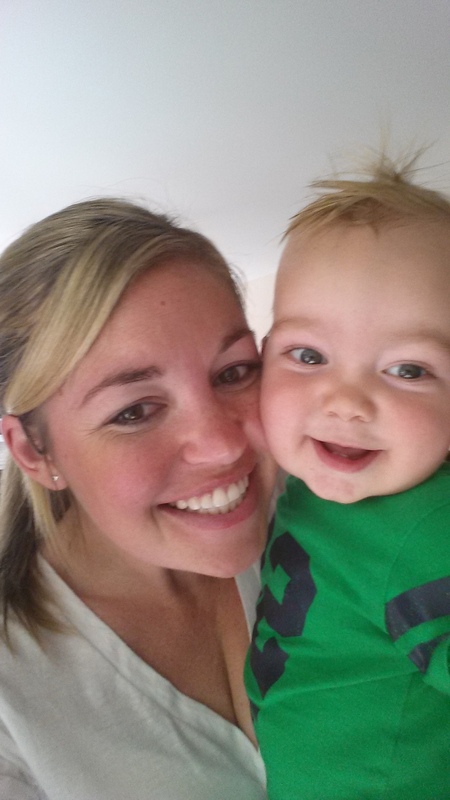 While the love between a mom and her kids is the absolute greatest reward for all that hard work, there’s some parts to being a mom that are not always glamorous. 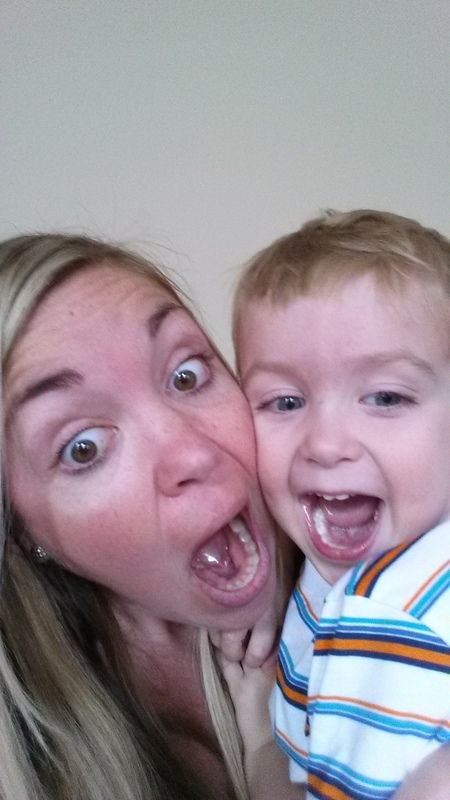 I thought I’d take a moment to list a few of the ways being a mom has changed my life- and perhaps find the good in those “not so glamorous” moments. 1.Never will I have to worry about getting lonely while peeing. Even when the bathroom door is shut, I can count on at least one little hand creeping under it to track me down. 3. It is completely acceptable to bust out in a Disney song, watch The Little Mermaid, and plan Disney vacations. I play it off like it’s for the kids, but who am I kidding? I freakin’ love everything Disney! 4. My body automatically wakes up at 6:30 AM every day. Nolan is my early bird and rarely sleeps past 7. That means, whether I like it or not, I get to see the beginning of The Today Show every.single.day. Being a mom has also made me appreciate the little things in life so much; drinking an entire cup of coffee while it’s still hot, having one too many glasses of wine and being able to sleep in the morning after, 20 minutes of quiet time to read, a solo trip to Target, an uninterrupted conversation with my husband, eating as slow as I want- using both hands, and starting a project and finishing it within the same day. Some of these things are unlikely to happen while my boys are still young, but that’s ok. I’m sure someday when I’m able to indulge in these little treasures, I’ll be longing for the days of rocking Nolan to sleep at night, getting blue Icee’s at Target to appease Brady while I shop like a madwoman, sharing chicken nuggets with the boys, wiping sticky handprints off my windows, pushing the swings “higher!”, “faster!”, “more!”, having to sneak out of the house to avoid sad faces looking out the windows if I dare go somewhere alone, and reading just “one more” book at bedtime. I can safely say that being a mom is more challenging than I could have ever imagined, but the truth is, it’s a job that I am blessed to have and am thankful for every.single.day. 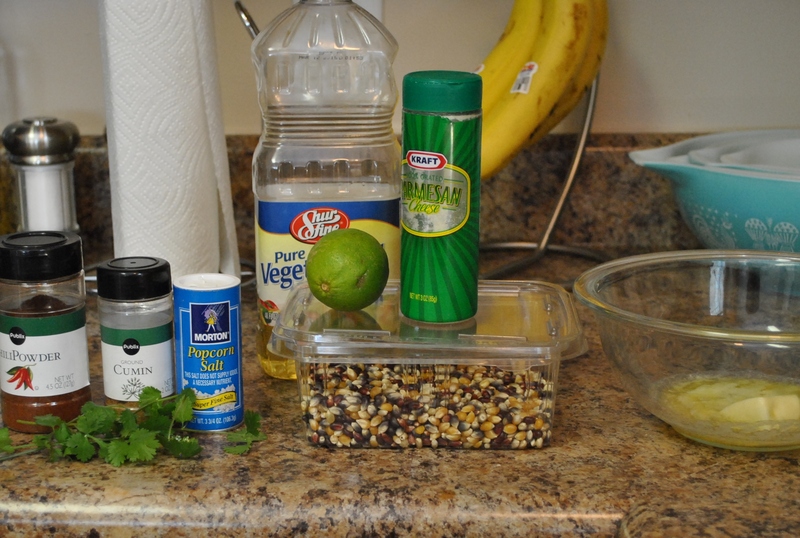 Mexican Popcorn- Kids Cook Monday! Happy Cinco de Mayo! Or…Happy “excuse to eat as much Mexican food as possible” Day! The hubby lived in Mexico for several years, so by proxy, we’re totally an authentic Mexican family. Right?! Anyways, we do cook our share of Mexican food around here, but I wanted to switch it up today. While we did go to a Mexican restaurant today for lunch, I thought it would be fun to do a different kind of Mexican themed snack for after Brady’s nap. 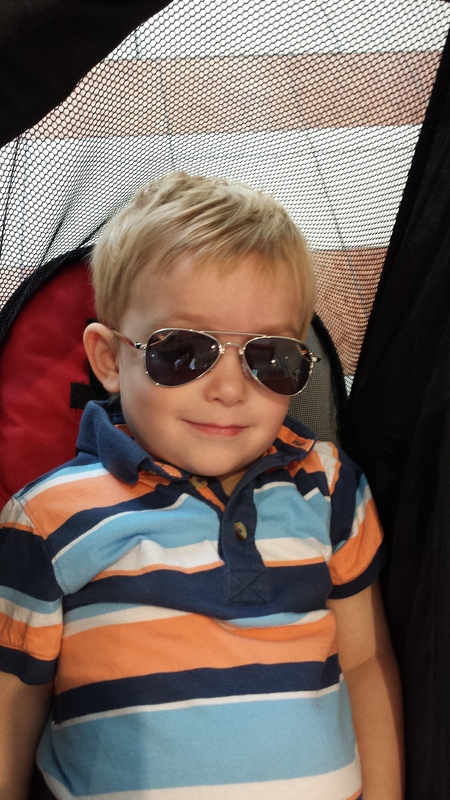 Brady was (ever so nonchalantly) requesting popcorn today. He brought it up in the car, and then again in Target, so I promised him that would be our after-nap snack. Stove top popcorn is so much fun to make! The anticipation of the first kernel popping is pretty exciting, like for me, as an adult. So, I figured Brady would love it too. And sure enough he did! We popped our popcorn according to the kernel directions and then added our fun, Mexican themed toppings. You could also make this with microwave popcorn, it’s just not as fun! For toppings we used a combo of fancy butter, seasonings, and cheese. 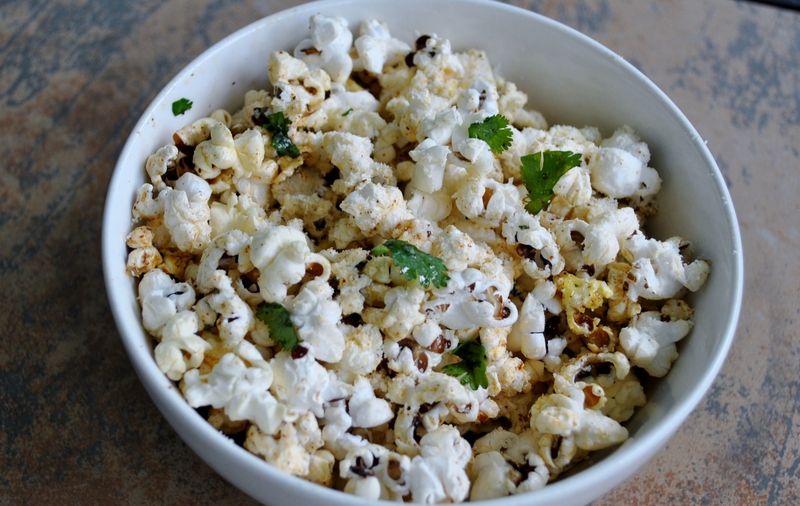 First we poured our “fancy butter” (a combo of melted butter, lime juice and cilantro) on the hot popcorn and shook it up in a big bowl with the lid on. Then we put our seasonings on the popcorn, put the lid back on, and shook it up some more. Finally, we topped it with a little bit of parmesan cheese. 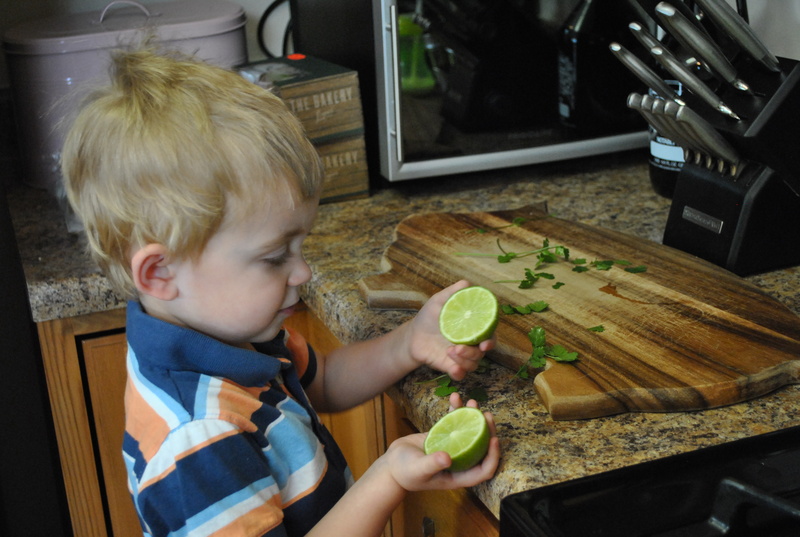 Pickin’ cilantro leaves off and squeezin’ limes! Shake, shake, shake! 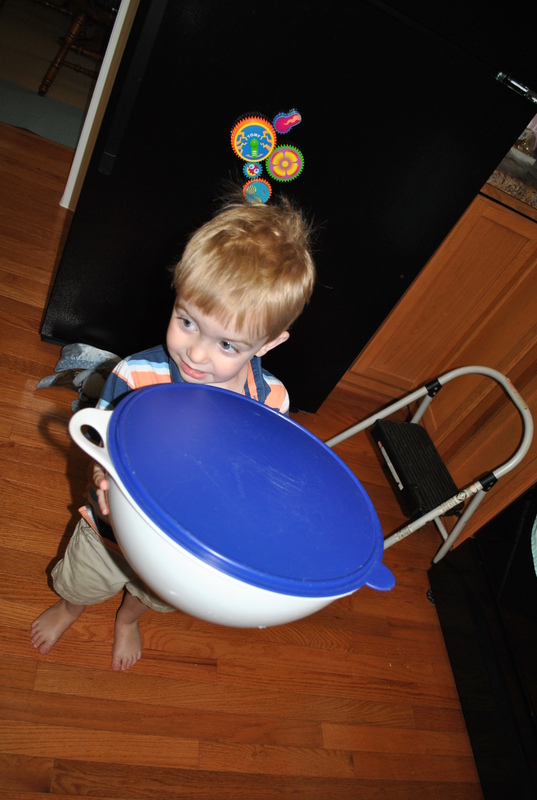 That bowl is as big as him! It was muy deliciosa! Que Bueno! And, as an added bonus, Brady got to use some of the cilantro we’ve been growing from our garden. Love, love, love when things work out like that!